Our latest project is to provide solar powered pumping equipment to extract water from a borehole for 2 schools in the same region of Tanzania as our previous borehole drilling project. Sekei & Naurei schools have a total number of 2066 pupils and the number will increase to 2576 in 2018 when 510 students are expected to join a new Secondary school. Both schools have no source of clean or safe water. The pupils use the water from the nearby stream, but the water is neither clean nor safe. 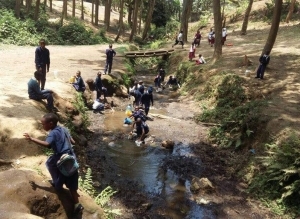 There is a water pipe which passes by these schools, but the schools can’t afford to buy the water from AUWASA (Arusha Urban Water Supply Authority) as it is very expensive. The impact of clean water for the schools will be fantastic. They will no longer have to scoop dirty river water into buckets and carry it, they will have safe, clean water pumped for them to use. As they will no longer have to fetch water from the stream they will not be depleting its waters. They will also have the opportunity to grow vegetables and fruit trees at the school campus, thus providing food as well. The water will not only benefit the pupils but also the families from the four local villages. This will help all families have more time for other economic activities because they will not spend most of their time searching for and carrying water.